Our own Mary Triplett is also making commemorative ceramic vases with bamboo as a thank you for each guest, as she has a family member currently fighting the disease. Reopening Saturday, July 5, 2014 at 5pm. Reopening Tuesday, August 19, 2014 at 5pm. These guys aim to have their own restaurants, so we want to give them an arena to show their true style outside the confines of their current jobs. Each chef will serve as cook at the other chefs' dinners as well. Have a limited quantity here for Valentine's weekend. Get them while you can! 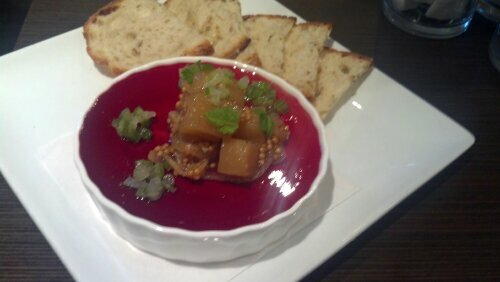 Red beet gelee, yellow beet mostarda, fennel, chartreuse. We brought in half a Berkshire pig from Autumn Olive Farms in Augusta, Virginia. Joe has been hard at work with various cuts; getting a house-made charcuterie program started. Finished bacon. Remember: brunch is served Sundays from 10:30-4:30. It sure will be fun to see how these things progress and the restaurant evolves. Amazing bean selection, very cool display.